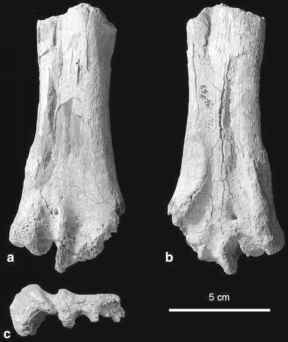 The extant species of this taxon are arboreal, frugivorous birds with a semizygodac-tyl foot and only occur in Africa south of the Sahara. Musophagiformes were considered to be most closely related to the Cuculiformes by earlier authors, but current analyses do not yield congruent results concerning their affinities (Ericson et al. 2006). The earliest fossils were recorded from the early Oligocene of Egypt (Rasmussen et al. 1987). These specimens, the distal ends of a tarsometatarsus and humerus, are very similar to the corresponding bones of the extant taxon Crinifer. The as yet unnamed species to which they belong was larger than any modern musophagiform taxon except Corythaeola. A proximal end of a humerus from the late Oligocene (Chattian) of southern Germany was assigned to the Musophagiformes by Ballmann (1970). This fossil comes from a bird which was larger than ali extant species of turacos, from which it also differs in several morphological features (Ballmann 1970). I consider it more likely that it is from a representative of the Idiornithidae (Sect. 13.2), probably of the taxon Idiornis itself. Musophagiformes should thus be expunged from the Oligocene fossil record of Europe, with which Ballmann (personal communication) agrees.